Great retrospective! I first found your site in 2009 while I was working & pregnant. I caught up with some of the back entries while I was home with my oldest son, and your site was part of the inspiration to start my own around the birth of my second son. Congrats on a decade of beautiful work and I can’t wait to see the new stuff!! 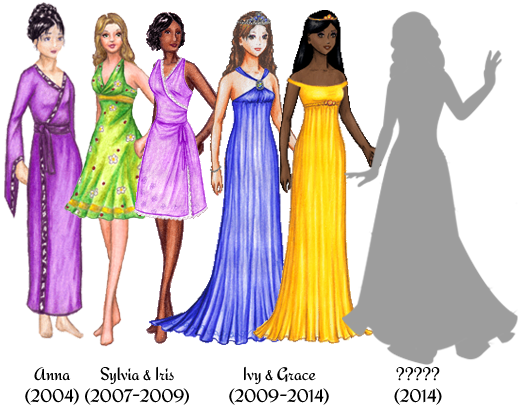 It’s been so fun to see all the fantastic dresses you’ve come up with over the years! I’ve followed this site for…I don’t know, 2008 or 09 -ish. I have actually printed and cut out most of the dresses, (Princess Ashe’s wedding dress? Eesh. But extremely pretty when finished)and oh, do I love indulging my 10-year-old self by playing with them. So excited to see what’s next! Can’t wait for the next incarnation of paperdoll-utopia! What a fun post this was. My favorite that you’ve ever done was the recession themed 18th century ballgown. It was just so smart and such a funny homage to the tendency of court ladies to politic with their clothing in the 18th century. What I value about your blog is that you often managed to tie your outfits into whatever was going on at the time. I think, perhaps because it takes me so long to get things done, that I’ve never been able to master that skill. (I’m proud if I remember holidays like Valentine’s Day). Good luck with the future of the blog, whatever it ends up being. There aren’t very many of us paper doll bloggers out there. We need all the support we can get.